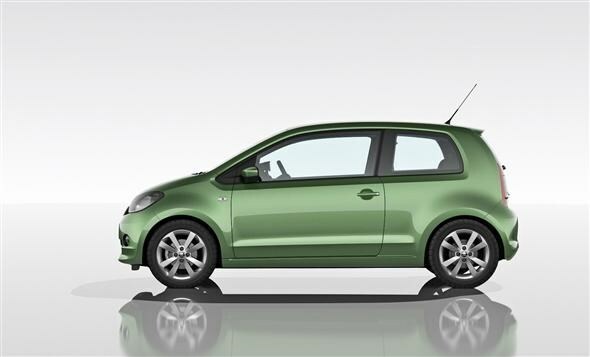 Skoda is getting set to enter the competitive world of city cars with the all-new Citigo. Even though the car's new to Skoda, it may already look a little familiar. That’s because it's based on the recently revealed Volkswagen Up. Set to become the sixth model in the manufacturer’s range, the compact car – it’s just 3,563mm long and 1,641mm wide – is about the same size as the Fiat 500 and likely be big competition for the popular Italian model. Despite its diminutive size, boot space is still a useful 251 litres and can be expanded to 951 litres by dropping the rear seats. Now, if you’ve been seen the recent news, you’ll notice that these are all identical to Volkswagen's version of the car. There are, however, some details that distinguish it from the Up. It gets a Skoda-styled front end with the family grille and headlights. There’s just the one three-cylinder 1.0-litre engine, but a choice of two power outputs. First is a 59bhp version that hits a top speed of 99mph and allows for a 0-62mph time of 13.9 seconds. There’s then a more powerful 74bhp option that will hit 62mph in 12.7 seconds and go on to a whopping 106mph. As you might expect, the little city car is all about low costs. The 59bhp engine is claimed to offer 62.8mpg and emit 105g/km of CO2, while the more powerful 74bhp returns 60.1mpg and 108g/km of CO2. This means both cars cost just £20 to tax. Later, there will also be Greenline versions that improve economy to 67.3mpg and 65.7mpg respectively, while dropping emissions to 97g/km and 99g/km of CO2. That'll make both models free to tax. While it might be small, the company claims that there are plenty of clever solutions that make it comfortable for four people. First is the ‘Easy entry’ system for the three door models. This folds and moves the front seats forward for easy rear access. The front headrests are also integrated in to the seats to free up more room. The clever touches continue with a portable sat nav system available as an option that also provides Bluetooth connection and ‘infotainment’ that allows the driver to view the trip computer figures through it or signals from the sat nav. 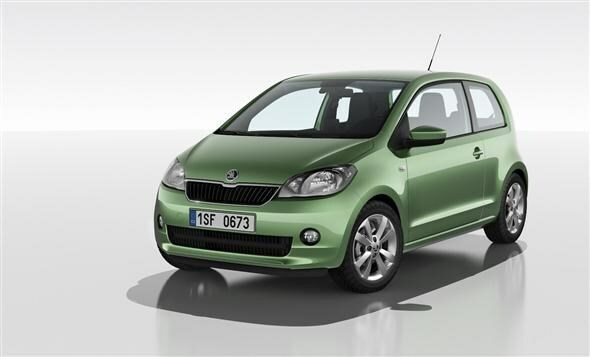 The Skoda Citigo is set to arrive in the UK in summer 2012 and expected to start at around £7,000 - approximately £1,000 less than the Volkswagen Up.